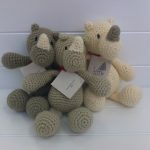 25cm soft toy (the two smaller ones on either side of the big one in the middle). 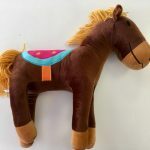 Handmade, local, hand-knitted and uniquely South African toy. Only one left. The Small Jozi Angel Doll – Soft Toy (the two smaller ones on either side of the big one in the middle) is hand-knitted, comes in a range of colours and is about 25cm tall. She’s cuddly and makes a good nap-time companion. The Small Jozi Doll was created by The Little Pine Tree. 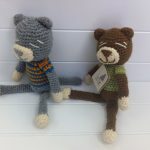 This local women’s empowerment project uses the art of amigarumi to make beautiful and unique products. 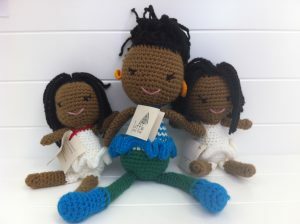 So when you’re buying a doll, you get a beautifully handmade gift at the same time as helping to empower others.